The VM-4HDxl is a high-performance distribution amplifier for 3G HD-SDI signals. The unit takes one input, provides reclocking and equalization and distributes the signal to four identical outputs. Multi-Standard Operation - SDI (SMPTE 259M and SMPTE 344M), HD−SDI (SMPTE 292M), & 3G HD−SDI (SMPTE 424M). Kramer Equalization & re‑Klocking™ Technology - Rebuilds the digital signal to travel longer distances. HD-SDI & SDI Input Indication LEDs. Compact DigiTOOLS® - 3 units can be rack mounted side−by−side in a 1U rack space with the optional RK−3T rack adapter. SDI Production Studios For Signal Distribution & Equalizations. Broadcast Studios For On-Air operation & SDI Field Production. 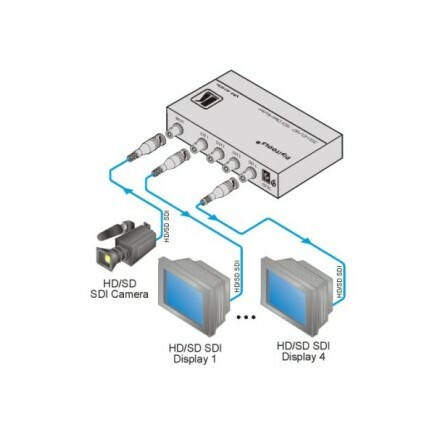 Unsing SDI Video Sources Such As Professional Digital Cameras. Max. Data Rate − 3Gbps. INPUT: 1 SMPTE−259M/292M/344M/424M serial video 75Ω on a BNC connector. OUTPUTS: 4 equalized and reclocked SMPTE−259M/292M/344M/424M outputs 75Ω on BNC connectors. POWER CONSUMPTION: 5V DC, 330mA. STORAGE TEMPERATURE: −45° to +72°C (−49° to 162°F). PRODUCT WEIGHT: 0.2kg (0.4lbs) approx. SHIPPING WEIGHT: 0.6kg (1.2lbs) approx.